Last time GNRs were being renewed there were complaints that there were not enough places representing the South side. The list as it stands so far this time includes north shore hot dogs, north shore Jewish steaks, north side old school pizza, north side Indian vegetarian, northwest suburban Uzbeki... but my friends, I have come with the solution to your troubles, like a mountain stream bringing cool water to the parched. This time people have nominated a fancy schmancy hamburger at a hip west town spot. I'm sure it is a fine one, as Kuma's creations are. But where does the hungry working man, who can't afford $8 for his saketini, go for an honest working man's burger? Is he to wander the earth forever, hungry? My friends, come unto me and sit, I will grant you succor. I have said before, my friends, that Chicago is, for all the millions of cattle turned into meat in this town, not a burger town. My theory is that, like Pharoah, the frozen patty established economic dominion over the peoples, forcing the fresh-ground burger out into the desert. 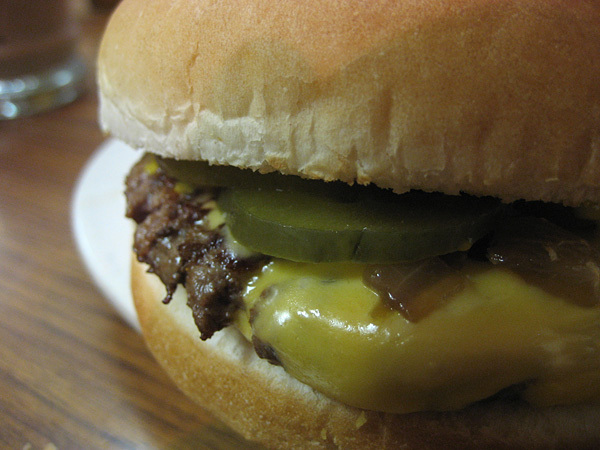 This much seems true for the north side; the fresh-ground burger, so common throughout the plains states and in Okie-settled Southern California, is almost unknown there. 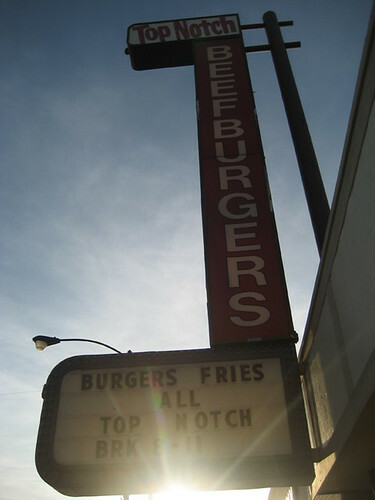 Yet go to the far south side and fresh-ground burgers exist in numerous places-- Hand-Burgers, Schoop's*, and above all the place generally, and to my mind, rightly acknowledged to be the best old school burger in the Chicagoland area, the most aptly named restaurant in Chicago, Top Notch Beefburgers. Your wandering days are over; deliverance is upon you. Go into the light! 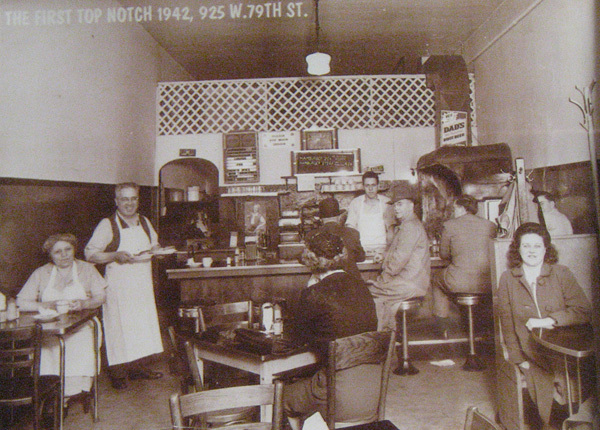 The original Top Notch was on 79th for about a decade; unlike many other South side white ethnic food establishments, they actually moved well before riot-era white flight kicked in, which is probably why (unlike, say, Cunis Candies) they only got as far as 95th. The neighborhood of Beverly is one of those charming small towns within the city, the strip Top Notch sits on has the kinds of businesses you'd find in a small town-- a dressmaking shop, a little gallery-- and the feeling inside is pure small-town welcome, as locals and waitresses catch up on the latest gossip. I could wish that Top Notch was a gleaming, vintage art deco burger palace, like Winstead's in Kansas City, but it isn't, it's homey and plain (and the Oak Lawn version, with Muzak and plastic plants and dusty rose-colored vinyl booths, has soulsuckingly drab strip mall anti-atmosphere). But it's thoroughly genuine, and despite its lack of visual charm, you'll be charmed all the same. But are you here for architecture? You are not. You are here for daily-ground ground round, fried in its own juices so that it tastes extra-beefy. Specifically, you want the 1/4 pounder basic beefburger. Though larger than the archetypal 30s-style burger (usually something like 10 to the pound), it is still thin enough to achieve a proper exterior, which the 1/2 pounder is not; it will get a bit soggy cooked the same way. If you must have more, order two. You want grilled onions, and you want the basic because who the hell would put mayonnaise and lettuce on a work of art? By the same token, even an inveterate cheeseburger eater like myself might consider going commando with no cheese next time; it is truly gilding the lily. What you will not have to order is the perfectly toasted bun, which has exactly the lightness to complement the freshly cooked meat, rather than smother it in styrofoamy breadiness. 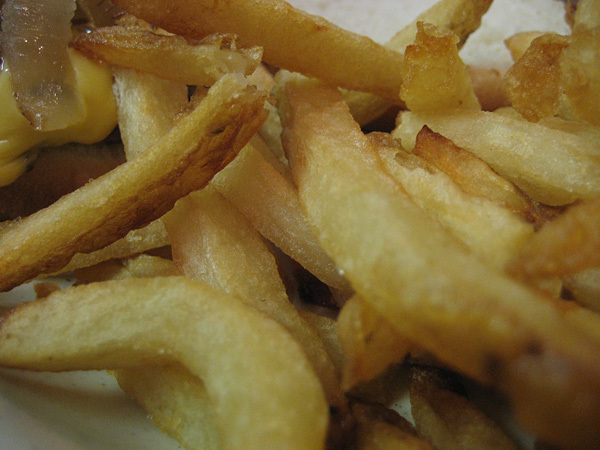 You will of course want fries, since they are cooked in beef lard and certainly among the five best French fries in Chicago. And why wouldn't you finish the classic American triumvirate with a chocolatey shake, pure American chocolate flavor, none of those Belgian or French notes, just classic Eisenhower-era chocorifficness. We named this one "Donnie Darko." Thanks largely to the ubiquity of the Food Network, everyone dabbles a bit in gourmet these days. Even bars that one would think should only cater in standard pub grub are going out of their way and dressing up their burgers with buns and sides our grandparents wouldn't dream of when they were our age. We're not knocking it, mind you. We're just saying that sometimes we just want a burger to just be a burger. Top Notch Beefburgers has never thought of being anything else. "you can do no better"
"another place that doesn't get its full share of LTH love"
Order the basic next time, Ronnie Suburban! Harry V pays tribute; so does Erik M.
* By the way, did anyone know about this? Last edited by Mike G on September 22nd, 2008, 12:21 pm, edited 1 time in total. Seconded. This is a fantastic burger in this style, with even better fries. The saturated fat mouthfeel of the whole meal is just outstanding. I'll happily second - this is the type of old school place that made me fall in love with LTHForum, and like many South Side spots, is richly deserving of positive recognition and the occasional pilgrimage. As Mike has stated before, the Top Notch Beefburger is the quintessential flat, charry, crisp-edged, buttery-tasting patty, one that the modern Steak 'N Shake is nostalgic for, and trying their best to emulate, with varying success depending on location. I swear that Redamak's used to approach this level when I was a kid (maybe anything tasted better on the way back from the orchards), but has fallen lately. Two issues: I've only been to the one in Chicago (near 95th and Damen), so in terms of the service component and the quality of the shakes and fries, I have no basis for comparison and can only support the single-location nomination personally. I hope others will chime in so we can establish what we're evaluating. Second, I more regularly worship at the altar of That's-A-Burger, a deserving nomination IMHO, and one I might eventually get around to. I will say that while I like the ground-before-your eyes, topped with bacon and jalapenos, served with a smile through bulletproof glass stylings of TAB, the fries are better at Top Notch, the room is well-preserved and charming, and the shakes are on their own plane. A well-rounded place worthy of attention. This is a great nomination (and one I had on my potential list as well). I completely support Top Notch as a GNR. It deserves the palque no matter how you interpert Great, Neighborhood or Restaurant. I've been to the Oak Lawn location a few times (as well as the Chicago), so I can vouch for it. Same excellent burger, same excellent fries. More of a Arnold's decor (which I like!). The Oak Lawn location has the very added bonus of being across the street of Cupid Candies, on the great (although somewhat under recognized here) South Side ice cream shops. I'd be up for a tag-team excursion one of these days. Now THAT'S how you sell a nomination. Even if people have never been there, they'd have a hard time arguing with this one. eatchicago wrote: Now THAT'S how you sell a nomination. Even if people have never been there, they'd have a hard time arguing with this one. Absolutely. I have a buddy who lives in Beverly and I will definitely have to check this place out next time I'm down that way. I really like this place, not so much for the burgers -- which are a fantastic example of a style that is not my personal favorite -- but for their fries, shakes and overall environs. I've only been to the 95th Street/Beverly location but based on my experiences there, I wholly endorse this nomination. And really, if you haven't been to Top Notch, it warrants a dedicated trip, IMO. I didn't even know about the Oak Lawn location! I remember going to the one in Beverly with my grandfather when I was a kid. I'm going to check out the one over in Oak Lawn on Saturday, it's very close to me. I think it might actually be in the same lot the old Coral theatre was in. My parents used to take me there when the Disney cartoons were re released when I was a kid. This has made my weekend! Agree, Agree, Agree. This is a GNR at its best. Amazing fries, great fresh burgers and shakes. I wish it were closer. Let me recommend one thing to people who have never been: stick to the 1/4lb patties. The larger ones just aren't particularly good, and they don't fit the style, anyway. If you must have 8oz of meat on your burger, ask for two 1/4 lb patties instead of one 1/2 lb one. They'll happily oblige. And get an oreo shake or malt. Right. The whole point of the 30s-style burger is that it's NOT a big thick bar burger patty, it needs to crisp up on both sides a bit and then kind of melt into the soft bun, not dominate it (which is why it doesn't need the much sturdier bun than larger burgers have). Personally, rather than get two 1/4 pound patties, I'd just order two burgers. But either way, stick to the 1/4 pound patties. Didn't know about the Oreo shake, though! P.S. One more important thing to note before trekking there: they're closed on Sundays. Both 95th st. locations, anyway. Having spent three hours on Saturday trying to get a Top Notch Burger, with no success, I can share this useful information. The Orland Park location, while it still shows up on maps and even my GPS as a Top Notch, is now a pancake house - Sophie's Waffles, I believe. The other Top Notch locations close at 930p on Saturday, so if you get there at 940, it is not much use. So the Bride and I went for a late pizza at Vito and Nick's, hardly suspecting we were continuing my whirlwind weekend of GNR visits. All right, I'll delete it from the original post. I thought Sdritz or somebody had once said it was closed. I think TNB closes at 8 (!) on weeknights. Another spot that I cant get enough of. this was my first burger joint that I loved since I was 6-7 y/o...it hasnt changed. I will say that this is the one place where I order my burger with everything (no ketchup) I like the deluze style from here and no where else. 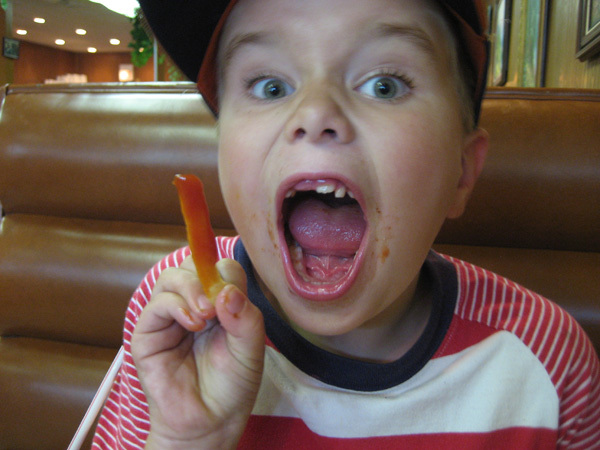 Fries are the best around too. 110% behind this. A definite renewal, in my opinion. 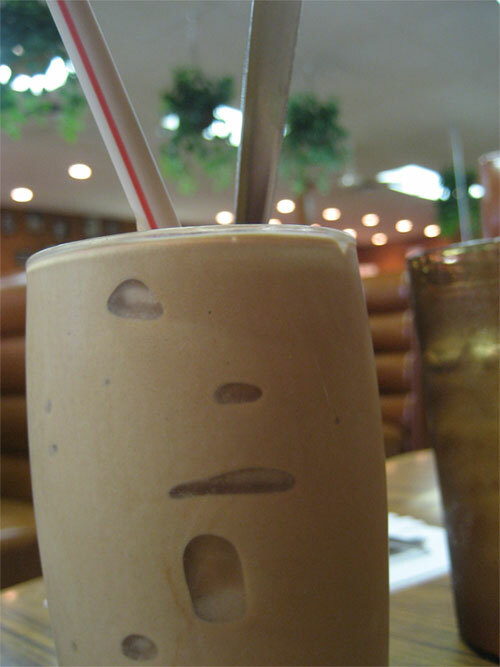 Great burgers, excellent shakes -- and both very distinctive style-wise. I love the vibe of the place and the way that tradition is carried forward here. A classic I always enjoy for burgers, shakes and fries. Top Notch Beefburger, count me a fan! Shouldn't it require an explanation as to why a GNR is being renominated? If the removal of a restaurant is going to be a public affair -- online posting -- versus simply letting a GNR expire then I'd suggest an explanation is due. I ate at Top Notch in late spring/summer and it is unchanged from when it first became a GNR and unchanged from the late 60's (other than moving five blocks west) when I lived in Beverly and ate there. The hamburgers, fries and shakes are the same. To simply state "nominated for reconsideration" does potential harm to a family business. In this case, that business is an hour drive or more from what I guess to be 90+ percent of LTH people. Which might explain the dearth of postings. If you are going to tell the world that a family business is "nominated for reconsideration" explain why. Top Notch's owners employed a lot of kids that I grew up with as waitresses, dishwashers and cooks. They helped put a lot of my friends and some of my family through school. I'd hate to see their business affected for one dollar without some explanation. Better to have never given them the award in the first place. (Actually, the original nomination was the best, most accurate and kind description of the place that I've seen in 40 years so I'll back track on my original award hyperbole. And LTH has sent a lot of love to TN so I don't get it). Am I wrong that this process could inadvertently harm a business? My husband grew up about 4 blocks from Top Notch. My first time there was 24 years ago-we had a burger before going over to his house to meet his Mom. I loved the food and atmoshpere. As she became an invalid, we would stop by and pick up burgers and fries to take to her. She loved them-and adjusted her diabetic food intake for the treat. After she died we had to clean out and sell the house-a summer long process. Top Notch never let us down. I have never had anything else but the burgers and fries but they are Top-Notch. I thought I had heard that they had closed or were closing. I hope this rumor is false. I second the GNR nomination. Went today to 95th and Western, in a tandem swoop with best-non-GNR Jimmy Jamm's. Our kind of place; quality and company hasn't fallen off one bit in the few years since my last visit (see: That's-A-Burger for delay justification). I hope folks will continue to post about this and other South Side gems even when they're second-nature neighborhood stops; more of Chicago needs to know what these beefy-crisp fries and real shake taste like. I posted about a recent visit in this thread. I support the GNR renewal for Top Notch. Good food, great ambience, a great slice of the city. 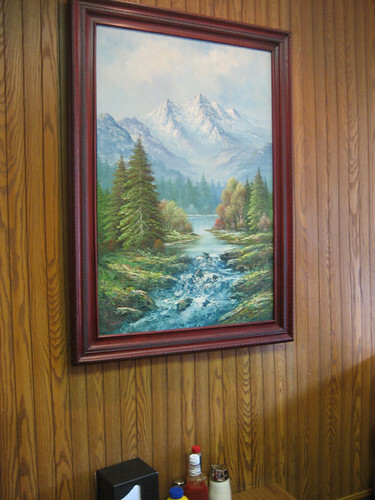 I'm having a hard time understanding how this one is up for reconsideration. In fact, I'd love to hear anyone make a coherent argument against Top Notch as a GNR. While there's been some improvement in recent years, the griddled burger selection in Chicago remains paltry. 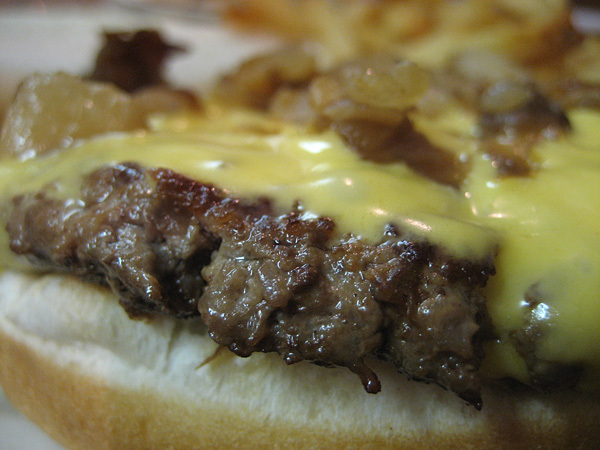 The beef at Top Notch is ground in-house and the burgers are flawless. Throw in some of the best fries and onion rings in Chicago (cooked in beef tallow) and the great shakes, and I think this place is a GNR even without considering it's place as a neighborhood institution for more than 60 years. When taking that history into account, not only should Top Notch retain its status as a GNR, it should be held up as a model when describing what a GNR should be. MarlaCollins'Husband wrote: I'm having a hard time understanding how this one is up for reconsideration. In fact, I'd love to hear anyone make a coherent argument against Top Notch as a GNR. I believe the main concern here regarding reconsideration was lack of discussion, not drop-off in quality. I see I screwed up; I ordered a 1/2 lb burger. But I wanted to go in with unaffected eyes and senses - perhaps a mistake. In any event, I still enjoyed the burger for its strong beefy flavor. The only issue was that it was a little dry. Fries were terrific, and service and atmosphere brought it all home. I fully support Top Notch as a GNR.